Monday, October 8TH, 2018 only students with 90 or more credits can register. Tuesday, October 9TH, 2018 only students with 60 to 89 credits can register. Wednesday, October 10TH, 2018 only students with 31 to 59 credits can register. Thursday, October 11TH, 2018 only students with 1 to 30 credits can register. 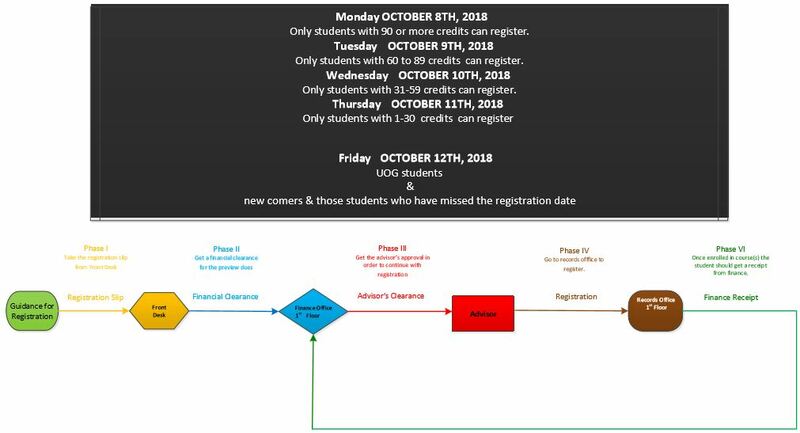 Friday, October 12TH, 2018 UOG students & those students who have missed the registration date. Classes that fall on holidays are to made-up for upon the discretion of faculty. Final Exams will take place during the regular meeting hours of each class. There will be no exceptions concerning the deadlines of the calendar! SUMMER COURSES WILL BE GIVEN, PROVIDED THAT MORE THAN 12 STUDENTS REGISTER FOR EACH CLASS. THE STUDENTS CAN SELECT NO MORE THAN TWO COURSES. THE FINAL EXAMS WILL TAKE PLACE DURING THE LAST MEETING OF THE CLASS. NO DROP & ADD WILL BE ALLOWED AFTER REGISTRATION!